For some, the idea of making a meal of raw fish, rice and seaweed is a difficult one to swallow (pun intended). 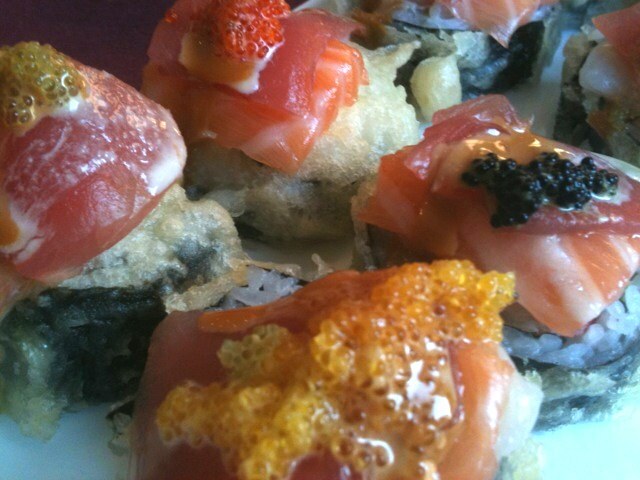 But for lovers of sushi, few foods are more delightful both from a taste and an aesthetic point of view. Sushi, in its many forms, can be not just a delicious but also an extremely nutritious meal, although Americanized versions of this Japanese classic can sometimes pack in the calories with extra sauces, fried ingredients, and "super"-sizing. 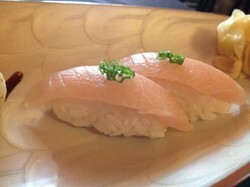 This article is my tribute to sushi, one of my all-time favorite foods. 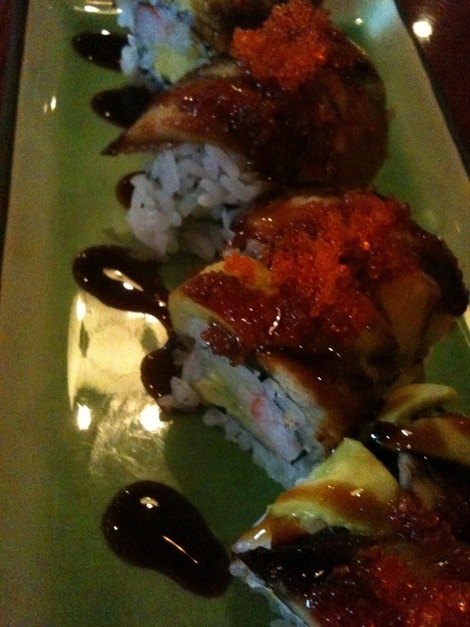 You'll find useful links and resources, restaurant reviews, sushi photos and nutritional information on sushi. So grab a pair of chopsticks and a seat at the sushi bar with me. And don't forget the sake! All photos on this page are by the author, sockii, unless provided by Amazon or eBay. How do you feel about sushi? I love sushi! I would eat it almost every day if I could. I like it all right, but it's not one of my favorite foods. I only like certain kinds of sushi. I don't like sushi at all. 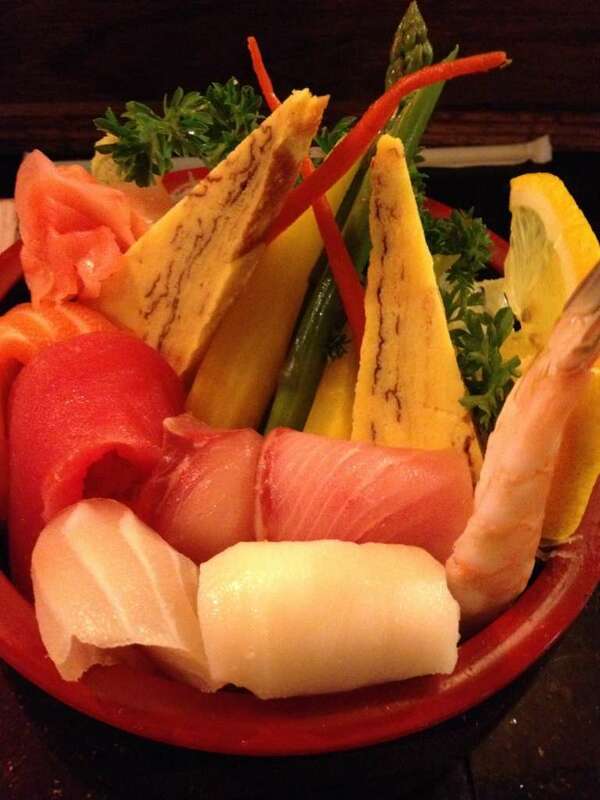 The history of sushi dates all the way back to the 4th century BC. In Southeast Asia, preserved fish was an important source of protein in daily diets. Fish was cleaned, gutted and salted and stored with vinegar rice, where the natural fermentation of the rice helped preserve the fish. The fish was stored for several months before consuming, and this was called "nare-zushi". The rice with which the fish was preserved was not consumed. 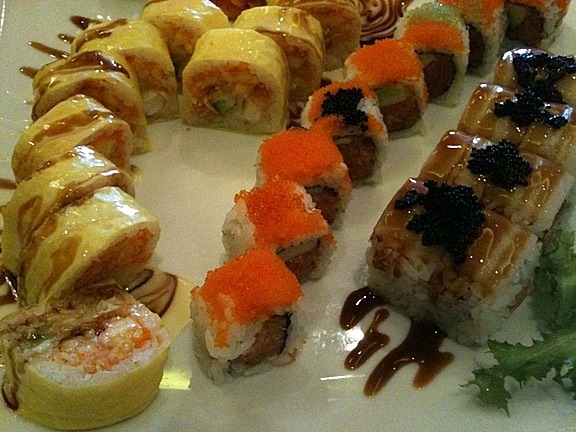 Sushi was introduced to Japan in the 8th century AD. As the Japanese preferred to eat rice with their fish, they developed a different kind of sushi, "seisei-zushi", where the fish was eaten while still partly raw along with the vinegar rice. 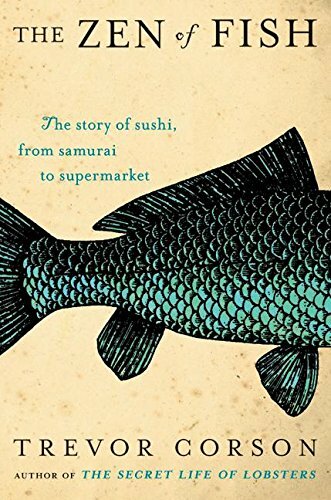 It was at this time that sushi truly began to evolve as an actual cuisine, and not simple a food preservation method. Sushi continued to evolve and change throughout the centuries, and in the 19th century "nigiri-zushi" as we know it today started to take shape, with rice, fish and seaweed served together in small bite-sized pieces. However it took until the 1980s for the "sushi craze" to begin to spread in the United States, where sushi was praised as a health-food and Japanese restaurants serving sushi began to appear in large cities around the country. Do you know proper sushi etiquette? Do you know the authentic Japanese way to eat sushi? Chopsticks or by hand? 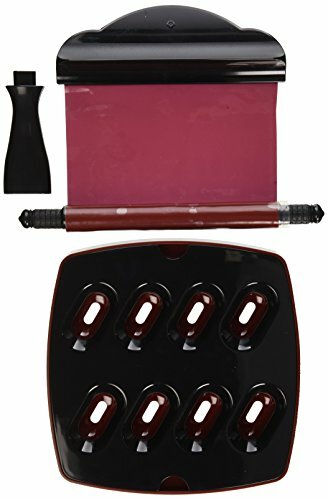 How to dip (or not dip) in soy sauce and use wasabi? Watch this great introductory lesson by an experienced sushi chef and learn! Sushi can be served in numerous different styles and certain kinds are especially popular in Western-style Japanese restaurants. Classic nigiri-sushi features a bite-size piece of fish on top of a hand-formed mound of sushi rice. Maki is rolled sushi, typically featuring vegetables and/or fish rolled in rice and nori seaweed, although soy paper can be used as well. Futomaki is a larger version of a maki roll often with numerous ingredients. Hand-roll or temaki sushi is similar to maki, but with the ingredients contained in a cone-shaped roll of nori and larger in size. Sashimi is just the fish alone with rice served on the side, and chirashi is a bowl of sushi rice topped with fish and other ingredients such as fish roe and Japanese pickles. For more information on other traditional forms of sushi and ones not often found in sushi restaurants in the United States, visit Asian Art Mall's list of sushi types or Wikipedia's extensive article on sushi. No matter the specific kind of sushi prepared, its visual appeal is always an important part of its presentation. Sushi should look beautiful to the eye as well as taste delicious! 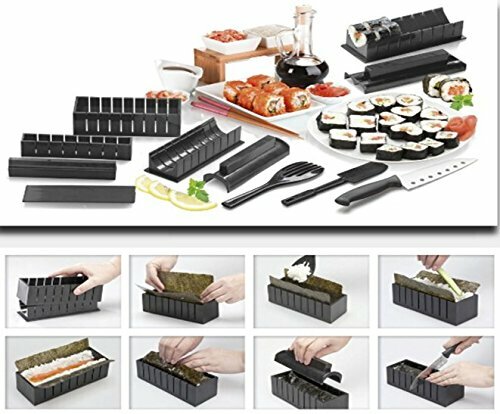 Want to Make Your Own Sushi at Home? Like many young children, I was a fussy eater early in life. I wanted plain pasta, burgers, pizza...all the things kids typically want to eat instead of healthy fruits, vegetables and meat. That began to change when my mother began working and attending school in New York City, where many different types of food were available to eat compared to the country small town where I was growing up. My mother began taking me on special occasions to Japanese restaurants when I was only perhaps 9 or 10 years old, and I soon fell in love with the food. While of course I began with "easy" meals like fried tempura and teriyaki, soon I was trying more exotic items like hand rolls, tuna maki and salmon nigiri. As a child I enjoyed the pretty arrangements of the sushi, and also how delighted the staff at these restaurants seemed to be that such a young "Western" child was so interested in trying Japanese food. We also began cooking Japanese food at home, although without a quality fish market in the area, sushi remained a treat for "evenings out" at one of our favorite sushi restaurants. 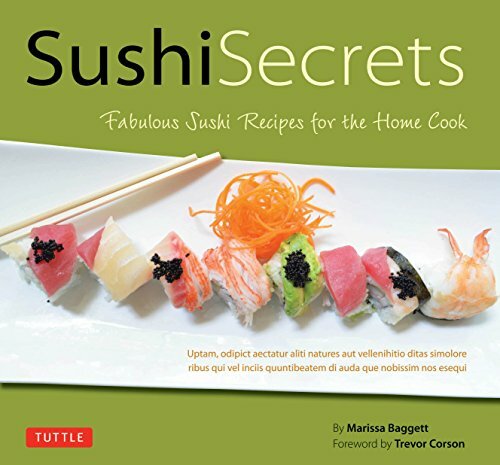 Want to learn more about sushi etiquette, varieties, and history? These links will provide you with some terrific information. Enjoy! 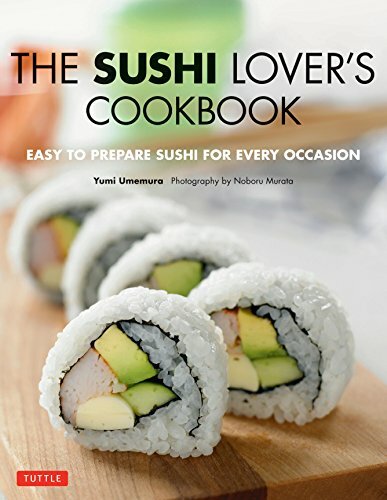 ything you need to know to enjoy sushi in restaurants as well as at home. Dining etiquette, nutritional information, recipes, and even a sushi bar locator can be found here. Another detailed, extensive site with etiquette, recipes, and an extensive marketplace of hard-to-find sushi kits, utensils and ingredients. 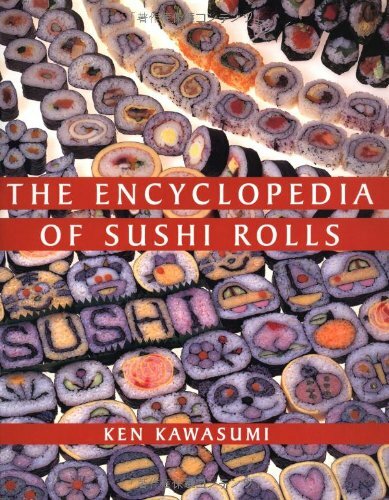 Wikipedia's extensive article on sushi, including information on many traditional Japanese varieties of sushi. 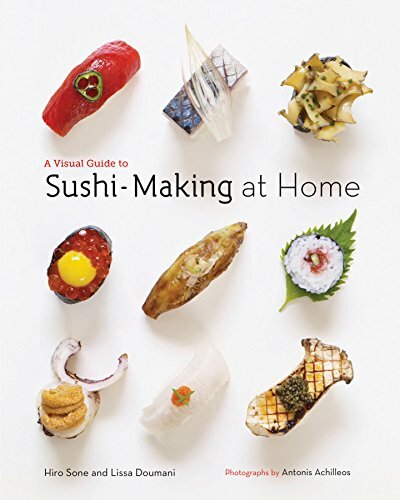 A link directory devoted to sushi recipes, ingredients, books, news and more. An attractive website dedicated to sushi history, recipes, etiquette, and with a message board where you can join other sushi fans in discussing this wonderful food. 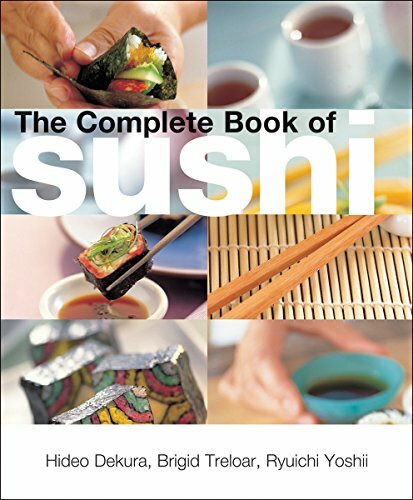 An amazing resource to all things sushi, including a lengthy glossary, how to prepare sushi rice, sushi kanji, calories, and restaurants. Beautifully illustrated guide to the different kinds of fish, vegetables and other ingredients found in sushi - as well as different types of sushi rolls, pieces and much more! Is Sushi a Good Choice for Dieters? Is sushi a good option for those trying to lose weight and eat healthy? If you are talking about traditional Japanese sushi, the answer is often yes. Simple nigiri, sashimi, and traditional maki rolls are quite nutritious and low in calories - and many Japanese restaurants offer you the option of brown rice instead of white rice for added fiber and nutritious content. 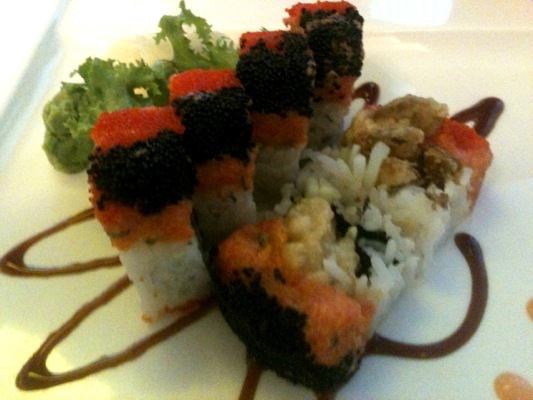 A typical California roll, for example, contains about 255 calories and 7 grams of fat. 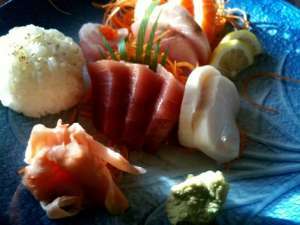 Most piece of nigiri sushi contain 40-65 calories per piece. So it is very easy to make a healthy, low calorie meal from a maki roll and several pieces of nigiri, or perhaps two rolls. 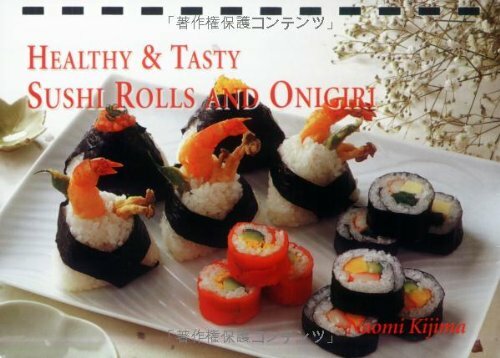 However, fancier, "Americanized" rolls have become increasingly popular, perhaps as a way to lure people into eating sushi who might be uncomfortable with the concept of raw fish and seaweed. Rolls containing fried tempura pieces - or where the entire roll is battered and fried like tempura - are increasingly popular, as are those drowned in sweet or mayonnaise-based sauces, or featuring ingredients like cream cheese and colored soy paper instead of nori. Such rolls pack in much heavier caloric values - a shrimp tempura roll, or tempura eel and avocado roll, is approximately 500 calories with 21 grams of fat. While such rolls can be tasty treats, someone watching their weight should be careful about what kinds of sushi they order and avoid such heavy, fried sushi items. 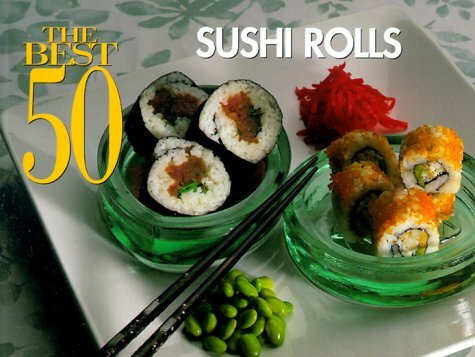 The Sushi FAQ's Sushi Calories and Nutritional Information Chart provides the data on many basic, traditional types of rolls and nigiri sushi, and My Fitness Pal's Sushi Nutrition Guide has a wide range of generic and restaurant-specific sushi items covered, including many fancy rolls. Do some research so you can plan what kind of sushi you wish to enjoy to stay within your nutritional, dietary goals. Is "All-You-Can-Eat" Sushi a Good Deal? Many Japanese restaurants looking to bring in business offer "All-You-Can-Eat" (AYCE) sushi menus, some only on specific days or nights, others every night. While the "All-You-Can-Eat" gimmick certainly appeals to many American diners' preference for quantity and large portions, does the "quality" measure up to regular sushi offerings or not? In general, I'd have to say no, it doesn't. AYCE sushi can easily suffer from many ways that restaurants can look to reduce costs while keeping diners' bellies full. They may pack the nigiri sushi with greater amounts of rice to fill up customers without having to use too much expensive fish. The fish may not be the freshest - be wary of restaurants that, perhaps, only offer AYCE sushi on one day of the week - that's probably the day they DON'T get a fresh shipment or are trying to use up old inventory. AYCE sushi restaurants can also pull other tricks to minimize their cost, such as limiting selections to less expensive items such as crab, egg, octopus, etc and charging additionally for premium items. They may penalize you for any pieces of sushi not completely consumed by charging you full price for them to discourage over-ordering. They may also try to fill you up with "free" soup or salad before you sushi comes, and bring out your sushi very slowly, to discourage you from ordering more. This is not to say every All-You-Can-Eat sushi meal I've experienced has been a bad one. But I would say that it is very, very rare and unlikely you will find the best sushi in your town or area at an AYCE sushi restaurant. The best sushi demands a premium because of the quality of both the sushi chef's skill and the quality of the fish they are serving you. Fun Gag Gifts and Decorations for the Sushi Lover! I hope you enjoyed my tribute page to sushi - and perhaps it has worked up your appetite for more! Please drop me a note to let me know what you thought, and where your favorite sushi restaurant can be found. 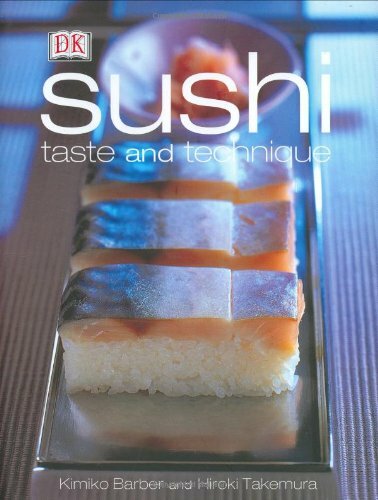 Should rename this Wizzle "My Sushi Bible". :) Sharing this in my circles. Thanks for adding to my foodie adventures. 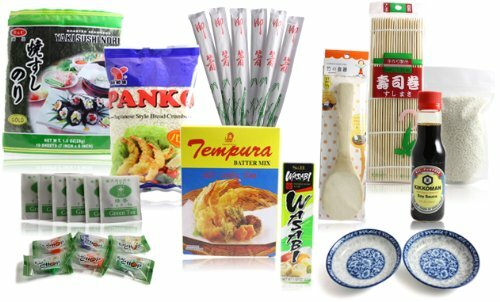 Do you know someone who loves Japanese food? Here you'll find recommended cookbooks, cookware, serving sets and more that would make for great gift items.